Seventeen-year-old Percy Shongwe performs a routine check of the 50 beehives outside his family's home in rural Swaziland. 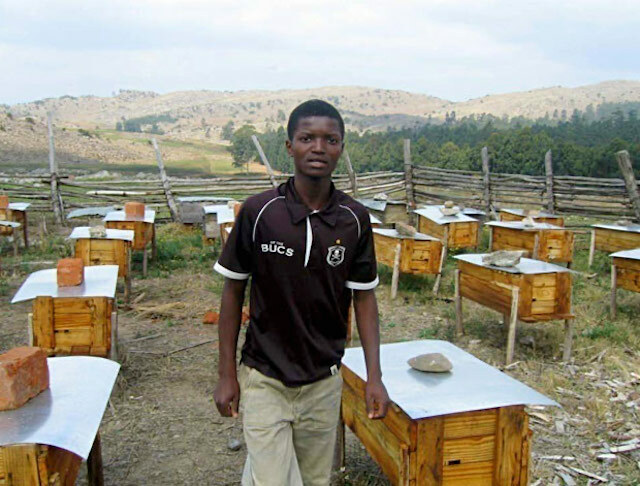 After participating in a beekeeping training organized by TechnoServe, Percy and his two brothers began cultivating honey and selling it to Eswatini Kitchen, a local producer of gourmet food that TechnoServe helped transform into a thriving business. TechnoServe worked with Eswatini Kitchen to improve their operations as part of our efforts to develop a honey industry in Swaziland and increase the incomes of rural beekeepers. The business now buys honey from more than 200 beekeepers, many of them orphans and vulnerable children who, like Percy, got their start in beekeeping through TechnoServe's seminars. Beekeeping allows Percy and his siblings to earn more than $7,000 in extra income for their household. The money eases the burden on their mother, a struggling teacher, and helps pay for their school fees. Learn more about our work with Swaziland’s honey industry.